Transgender Protection Passes in Dallas County! Dallas, Texas – By a vote of 3 to 2, the Dallas County Commissioners Court passed employment protection for Transgender people who work for the county. After a five-week struggle, both sexual orientation AND gender identity and expression are now protected classes under the law for the county’s approximately 7,000 workers. According to the Dallas Voice, the vote of 3 in favor of Court Order 21, and 2 opposed fell along party lines, with Democrats Judge Clay Jenkins, John Wiley Price, and Dr. Elba Garcia in the majority, and Republicans Maurine Dickey and Mike Cantrell in the minority. As dozens of Transgender men and women held their breath, Commissioners Dickey and Cantrell announced their intentions to vote ‘No’ on the proposal. Dr. Elba Garcia said she was voting in favor of full inclusion, calling it an act of “justice,” and a step toward catching up with the rest of the world. John Wiley Price, citing medical advice he had sought out, agreed with Dr. Garcia that this vote was about doing the right thing. He called the question, and Judge Clay Jenkins counted the votes necessary to make Transgender protections a reality for the many gender variant people who serve the county. A roar of approval rose from the crowd in the courtroom, and the celebration continued outside on the steps of the Dallas County Administration Building. Rafael McDonnell, who tirelessly worked for passage of the court order, exuded joy as he thanked all the supporters and the county commissioners who made today’s victory for equality a reality. The vote will have impact across Texas and the nation, given the leading position the Lone Star State holds in size and reputation as a conservative bastion. Dallas County is now ranked the ninth most populous county in the United States at over 2,400,000 people. It now joins Texas municipalities such as Dallas city, El Paso, Austin, and Houston in full protection for both sexual orientation, gender identity and gender expression for employees. 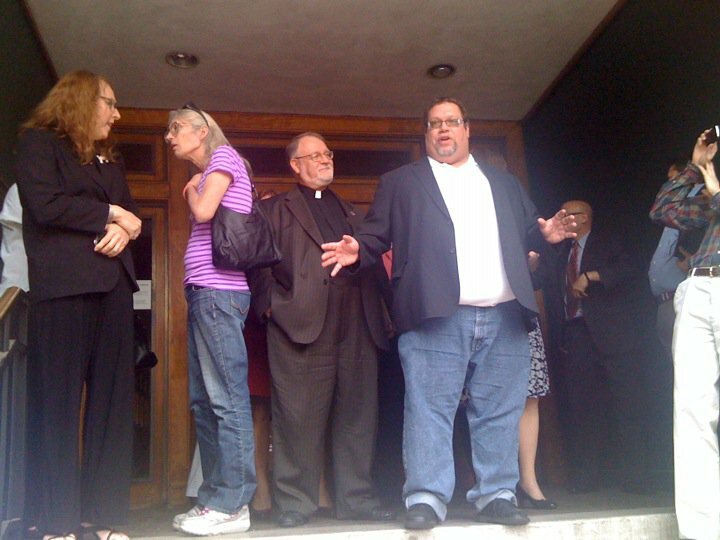 April 26, 2011 Posted by unfinishedlives | African Americans, Anglo Americans, Bisexual persons, Brite Divinity School, Dallas Commissioners Court, Dallas County Texas, Dallas Gay and Lesbian Alliance, gay men, GLBTQ, Latino and Latina Americans, Latinos, Lesbian women, Politics, Resource Center of Dallas, Social Justice Advocacy, Texas, Transgender Equality, transgender persons	| African Americans, Anglo Americans, Bisexual people, Brite Divinity School, Cathedral of Hope, Dallas County, Dallas County Commissioners Court, Dallas Gay and Lesbian Alliance (DGLA), gay men, GLBT, GLBTQ, Latino / Latina Americans, Lesbians, LGBT, LGBTQ, Politics, Resource Center of Dallas, Social Justice Advocacy, Texas, Transgender Employment Protection, transgender persons | Comments Off on Transgender Protection Passes in Dallas County!